It’s been a while, but I haven’t been idle. I have a few projects in the pipeline, hopefully coming soon. In the meantime, my latest is available right now. Welcome to the world of Crypto Bizarro, where all manner of ghosts and ghouls and things that go “bump” in the night come out to play. This fully-illustrated collection of horror includes short stories, poems, puzzles, cryptograms, secret messages, a choose-your-own-adventure tale, and more. From restless spirits to physical monstrosities, dastardly acts and forbidden rituals, the frights found within ask the reader to question their reality. As the tome comes to life in your hands, you’ll have to search beyond the book itself to unlock all of its mysteries, but take care—when you venture into darkness, the unknown has ways of making itself known. 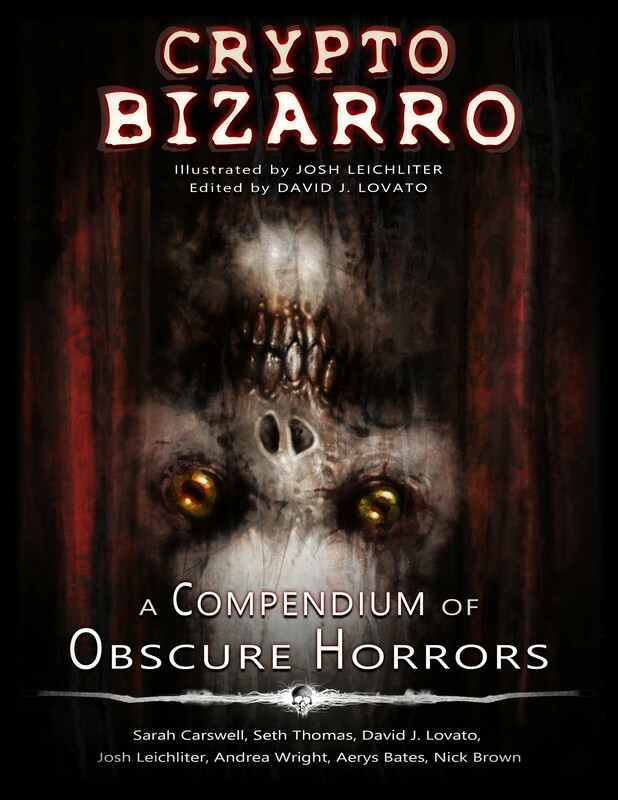 Crypto Bizarro is a fully-illustrated collection of horror-themed short stories, puzzles, and poems for a mature audience. This collection is the culmination of two and a half years’ worth of work and correspondence between myself and Josh Leichliter, as well as the contributions of our wonderful writing and producing team: Sarah Carswell, Seth Thomas, Nick Brown, Aerys Bates-Leichliter, Andrea Wright, and Ariana Wright. The book is available in hardcover and eBook formats. You’ll find links at the bottom of this post. Crypto Bizarro is more than a collection. It’s a brand, a flavor if you will, and this collection is just the start. To keep up on all of our crazy ideas, visit www.cryptobizarro.com and sign up for our mailing list, or follow our page on facebook. Right now you can find a few free samples and a nice little puzzle, with more on the way. This is meant to be a growing, evolving, living (or perhaps undead?) collection, and Josh and I have much more up our sleeves.